Venezuela crude exports are moving lower, but there's no collapse. 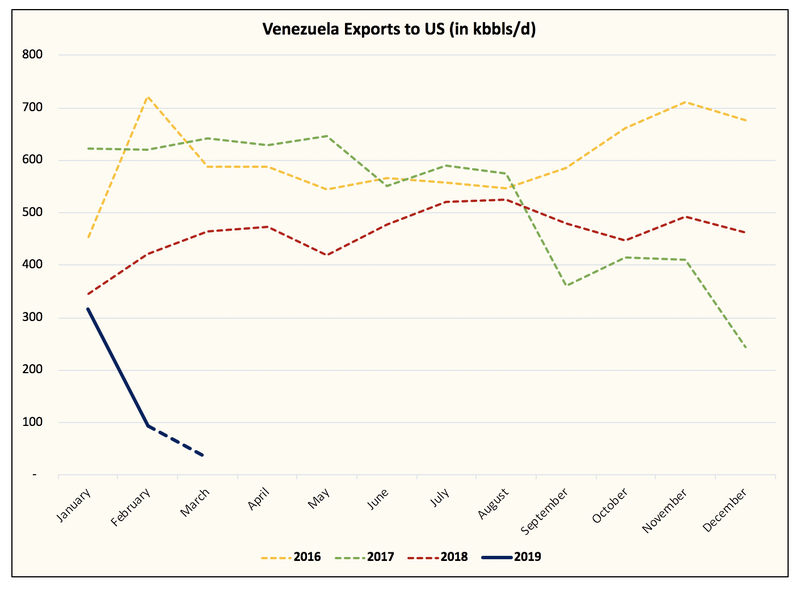 But if you thought Venezuela's crude exports would collapse because of the sanctions, then you have to think again. While the data shows that Venezuela's crude exports will move to sub ~1 mb/d for March, and exports to the US will gravitate towards zero. The volume is simply being shifted from the US to China and India. 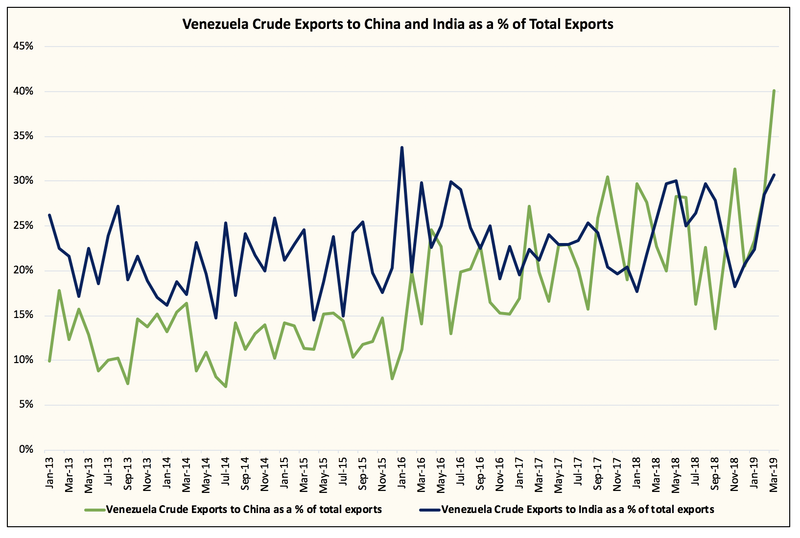 You can see that China is now taking a proportionally larger percentage of Venezuela's crude exports. 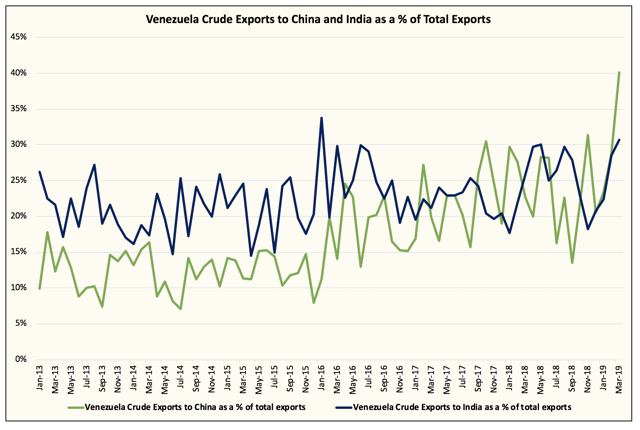 As a result, it won't matter if US applies another layer of sanctions on Venezuela, because China and India will likely continue importing Venezuela crude. So if the sanctions on Venezuela doesn't result in an immediate regime shift, then that is bad news for US refineries because the heavy crude shortage will only worsen. As you can see in the chart above, WCS Houston trades at a premium to WTI all the way to November of this year, while WCS-WTI spreads are averaging in the mid-teens to year-end. If our assumption about US crude storage draws materialize, then the shortage will worsen further resulting in even stronger heavy crude pricing in the US. This will impact refinery margins and reduce throughput, which could result in a product shortage down the road. The crude quality issue is not getting enough spotlight, but it will soon enough. From an investment point of view, readers should be positioned in heavy oil producers as the crude quality issue worsens. Our favorites are California Resources (CRC), Gear Energy (OTCPK:GENGF) (GXE.TO), and Cenovus Energy (CVE) (CVE.TO). Disclosure: I am/we are long CRC, GXE.TO, CVE.TO. I wrote this article myself, and it expresses my own opinions. I am not receiving compensation for it (other than from Seeking Alpha). I have no business relationship with any company whose stock is mentioned in this article.